So, my hubby and I had our home built 2 years ago. Our closing was on our 9th wedding anniversary. Not so shabby gift huh, thanks universe! It literally took two years to muster up the energy to start my daughters' room. My little helpers. It was more work in the end. Clean up was a ... shut your mouth! It meant so much to the girls to be part of the process of decorating their room. These two little rock star divas decide that they want their bedroom to be pink and orange. Where did they get those colors from I don't know. Gabby said she wanted pink and Trinity said she wanted orange in the room. From there, their bedroom color scheme was born. Now to keep it real I wasn't going to entertain them, but I told them they could pick the color and I am a woman of my word. I never thought they would pick those colors either, but glad they did. It kept me on my toes. No fluff or staging this is the room in the raw. Bonus points, they made their own beds the morning I took the picture. 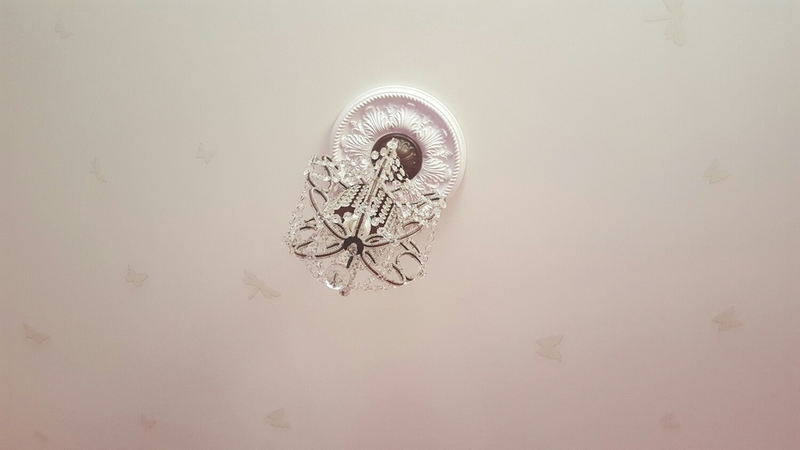 The butterfly decals are glow in the dark. They lead to the ceiling where I have them all throughout. Tree decal is from Target, Butterfly decals from Walmart, Zigzag bedding and lamp from Target, beds from Macy's. The color scheme totally suits their personalities; bright, fun, girly, sassy, with a little bit of toughness. Both of my girls dance in ballet and tap. They also do Tae Kwon Do, as well as skateboard and cartwheeling is their mode of transportation. Accents of green, purple (Trinity's favorite color), and blue add whimsy and fun to the room. My fashonista's have organizers to keep their dresser neat. It houses their jewelry and other items that would otherwise look like clutter. The lava lamp music player was a gift from their auntie. Gabby picked the rocks from the community. she picked the most beautiful rocks she could find outside and wanted to keep them. I feel the add a "natural touch" and some good energy to the room. There's the corkboard center with Trinity's rainbow cloud mobile made in school and pictures of family and friends. I have a light up crown for my little princesses above the mirror. Dry erase message board on the other side. Organizers, crown, cork board, message board and little notebooks are all from Target. Many from the $5 bins near the front door. Music lava lamp from JCPenney. Furniture from Macy's. A little something I found a Walmart that I want to remind my girls everyday to stay grounded and true to themselves. I placed it above their closet door. Chandelier to add drama and whimsy to the room. It looks so much classier with the medallion. Both from Lowes. I added glow in the dark butterflies from Walmart. I added diamonds from Hobby Lobby for some bling. I upcycled these bookends and used them as a shelf to hold the skateboards. The skateboards can be easily grabbed whenever the girls want to go outside for a ride. Technically they can add items to the shelves, but they don't because they want to just grab their skateboards and go. This was a fun way to add color to the room. The paint was from Lowes. Most items from Walmart and Target. Everything for the room was affordable. The most expensive pieces was the furniture from Macy's. I wanted something durable to last years to come. I got a deal because items were purchased during the holiday sale season. Hey, that was a tip! I do not receive any affiliate fees from these stores. I just really want to show you how to decorate on a budget. You don't need lots of money, just a little imagination, and some time. If you don't have time, then I can help. Check out my services page to see how I can help you create the home you desire on your budget!